My Peace Corps training in Hawaii was magical but it didn’t prepare me for the rural isolated living I was to experience for two years. My assigned project located (in a very poor area) was to improve nutrition by teaching better-quality poultry methods. Through much effort and sweat my poultry project was completed. However, it did not last long due to theft and abandonment of those responsible for maintaining it. This was a hard lesson for me especially since my PC partner was sent back to the USA after three months in country. Being alone with no other PCV near was very hard and lonely. My poultry houses were beautiful being well built and having all the latest equipment to raise superior poultry. In fact, they were the first ones completed among the India 27 group in Orissa. Within four months disappointment and disillusion entered my emotions with the loss of my PC partner, the short life of my poultry project and the isolation that took over. One of my dreams was to find the house I lived in many years ago. I journeyed to the seaside town of Gopalpur On Sea near my village. One of my dreams was to find the house I lived in many years ago. I journeyed to the seaside town of Gopalpur On Sea near my village. All the people I knew had moved or died. I employed a local fellow to help me find the house. After much searching we finally found it. Build of cement and yellow stucco with a tin roof it popped out! When I lived there it had no running water or electricity. Nothing had changed. The toilet was a hole in the floor, the separation of rooms was done by cloth dividers and a persistent mildew covered the walls. I gazed at the house as if in a dream feeling the old memories flood over me. The daily drawing water from the outdoor well, the weeks “marooned” inside during the monsoon rains and the endless array of bugs. Soon a thin old man came out and asked in Indian fashion ‘Most happy to help you,’ I explained why I was there and asked to go inside and look around. He was most happy to oblige. I soon found out that the old man was the head teacher at this rural agricultural training school. He explained that there were no students for two years and that the government hadn’t provided funding for teachers for the same amount of time. The afternoon was spent being shown around the old familiar grounds of the school. Ironically as much as I wanted to stay at the school and relive the memories, the heat and humidity prodded me to return to my nearby hotel. Now I wish I had stayed longer. Perhaps when I was 25 years old I had more staying power. Gopalpur is located on the Bay of Bengal about 500 miles south of Calcutta. I used to bicycle the 10 miles to the sea (where there was no cars or motor vehicles of any kind.) and find some human company, swim in the sea and have a cold Coke at the stately Palm Beach Hotel. 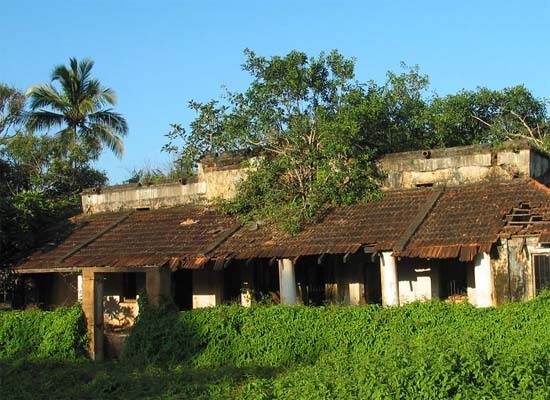 Gopalpur was a refuge from my life at the agricultural training school in Orissa. Gopalpur is located on the Bay of Bengal about 500 miles south of Calcutta. I used to bicycle the 10 miles to the sea (where there was no cars or motor vehicles of any kind.) and find some human company, swim in the sea and have a cold Coke at the stately Palm Beach Hotel. With my Peace Corps allowance that’s all I could afford. There are now more people filling up the fields and open spaces with their buildings and simple stalls. Cars and motorcycles constantly blast the countryside with their horns. The quiet I once knew is shattered by these horns. Now that I could afford the Palm Beach Hotel it had closed down and so I stayed at the next “best” seafront hotel called the Sea Pearl. Gopalpur’s beachfront is full of rundown buildings and old crumbling hotels. Looking out of my hotel room window glimmered the great vastness of the blue Bay of Bengal and an endless white sandy beach. The changes with the Internet can be found with its connection to the outside world inviting the materialism which brings about the inevitability of change. I could not help but wish for those days when bicycles and bullock carts creaked by and drinking a cold Coke was pure luxury. 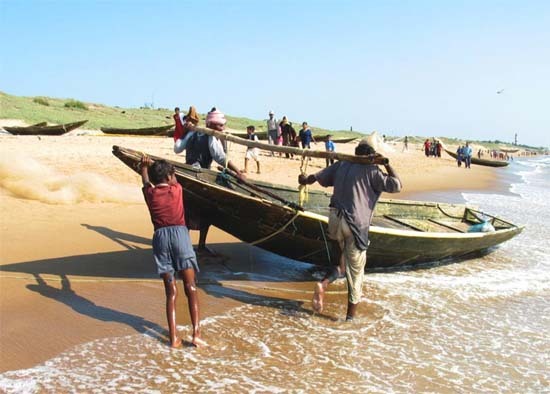 The fishermen who live near the beach at Gopalpur were all there as if frozen in time as in a snapshot. Their traditions and culture have changed little, and they continue to be connected to the essence of nature. From the youngest to oldest, or highest and lowest cast; everyone has a purpose in life. They have an acceptance of life seldom found in the Western world. Each day I’d leave the Sea Pearl Hotel and venture among the fishing families, photographing their timeless activities, their faces and interactions . After a day of photography and a simple meal (due to a restless stomach), I set out to stroll along the lanes of Gopalpur looking for a particular house called the “Nook,”a refuge for me in the old days. Was it still there among the ruble of old buildings the “Nook,” Ms Hannay’s house? As I turned a corner I noticed a vaguely familiar structure altogether obscured with overgrown vegetation and brickwork crumbling back to earth. There it was---the “Nook.” The memories of a place of retreat and kindness brought back feelings of nostalgia and tears for my youth and it’s simplicity. I could almost hear a small voice calling me to come and share a cup of tea. On a hot afternoon many years ago I was riding my bicycle along a beachfront lane when I heard some one calling out in a British accent ’hello there.’ There on the front porch stood a tiny old lady. I approached closer. She soon invited me into her dark cool house for a cup of tea. She introduced herself as Ms. Francis Hanny. This meeting began a deep friendship with a wonderful eighty years old expatriate from Scotland. Ms. Hanny had been living in British Burma and India since the 1920’s. Our friendship developed rapidly over the months. I looked forward to sitting down with her in her humble old house and having tea a biscuit and sharing our experiences. To be able to converse in English again was a joy. Ms. Hannay taught me many things such as humility, kindness and how to enjoy a good cup of tea. How wonderful those times were for a isolated American. 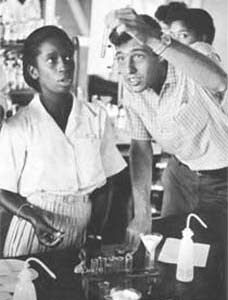 I think now that I was not the only one lonely I learned about 25 years ago that Ms. Hannay had passed away. 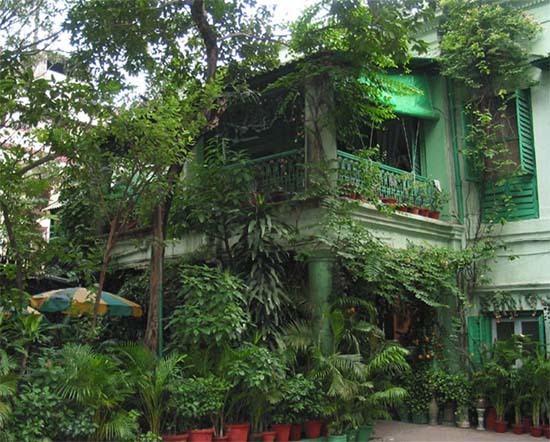 The second best thing is not so bad for on my walk back to my hotel I heard a lady’s voice calling out ‘hello.’ Near the “Nook” stood the house of Mrs. Dutt. She began a friendly conversation with me and soon whisked me in to her veranda to have tea with her and her son. The second best thing is not so bad for on my walk back to my hotel I heard a lady’s voice calling out ‘hello.’ Near the “Nook” stood the house of Mrs. Dutt. She began a friendly conversation with me and soon whisked me in to her veranda to have tea with her and her son. What a surprise. Oh how India still provides many unexpected adventures. Mrs. Dutt had known Ms Hannay. So I had the delicious opportunity to relive some of the shared memories about Ms Hannay from many years ago. Upon my return north to Calcutta and the USA. I stopped off for a visit in the capital city of Orissa called Bhubaneswar. Bubaneswar is described as the city of temples filled with many unique Hindu temples from centuries past. Once a small provincial city, Bhubaneswar has grown like all of India. There were more cars, buildings and people. I now stayed in a Hotel I could never have afforded as a PCV. I remembered my first visit in 1966. I stayed in the house of some PCV’s . I was jealous since they had both electricity and running water and I did not. However, I still had to sleep on their floor in my sleeping bag . It was still great fun being with other PCV’s. Calcutta a great city of culture and poverty. Calcutta has changed very little over the last 34 years. I experienced the same humanity existing on the crowed streets, the jammed sidewalks streaming with people rushing and going nowhere. The vestiges of former colonial grandeur line the streets in their decrepit splendor. 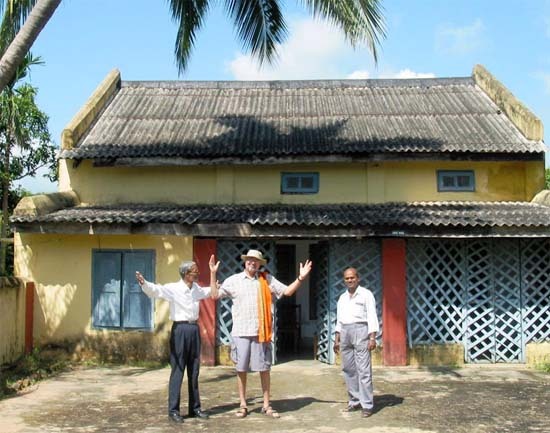 Calcutta for me was like entering another time with its rickshaws pulled by emaciated men, beggars and crumbling aged buildings..
As a Peace Corps Volunteer I would dream of going up to Calcutta by train from my isolated rural life in Orissa. I would dive into the many exotic adventures offered it’s the food, cinemas, companionship and air-condition. How wonderful! Many times I’d stay at the Fairlawn Hotel. The place was a heaven for me because I could meet other foreigners and occasionally Peace Corps Volunteers. To my surprise and excitement I found that the Fairlawn still existed. Many times I’d stay at the Fairlawn Hotel. The place was a heaven for me because I could meet other foreigners and occasionally Peace Corps Volunteers. To my surprise and excitement I found that the Fairlawn still existed. I was determined to stay there during my current visit. When I was left off by taxi in front of the Fairlawn Hotel I couldn’t believe my eyes. The hotel hadn’t changed. Originally built in 1802 as a residence for a British official, the Fairlawn has been a guest hotel for over 70 years. As I climbed up the ancient staircase to my room I became enveloped with the atmosphere of times past. I could gaze down on the unchanged small dining room with it’s antiquated furnishings and dusty rugs .. My room looked the same as when I first slept there, frozen in time as if from the 1930’s with no modern improvements. It should be noted that the total Peace Corps budget for 2006, as well as the total USA tsunami aid, amounts to less than 2 days of Iraqi war costs (assuming $6 billion/month for the latter).